ADVANTAGES: Easy assembly Gate Kits are adjustable, you can cut down to size to fit existing openings & shipping cost are lower! This gate frame kit includes all Frame parts, Mesh, Hinges and Latch. *GATE POSTS are purchased separately. **Gate Kits are adjustable, you can cut down to size and fit existing openings. All sizes are listed HEIGHT X WIDTH (opening) . Chain Link Fence Gate Kits are 1-3/8" & 1-5/8" Frames. Posts are not included and are purchased separately. 5 ft, 6 ft, 7 ft, 8 ft and 10 ft heights have mid-rails. The horizontal pieces are full length. So 4 ft wide gate will have 4 ft wide pieces. After adding corner clamps the finished width will become approximately 4ft-2-1/2". This allows for any existing gate opening to be properly filled. These gate kits are extremely popular due the fact that they can be adjusted to fit exact opening by cutting horizontal pieces down to size. Unlike rigid welded gates! To calculate total space between posts for Single gate, using full length of the horizontal supplied. example : the gate with 4 ft wide frame will be 50.5" , plus 2" for hinge spacing and 2" for latch spacing. Total space between posts = 54.5"
Double gate spacing between posts, for example 8 ft wide: 50.5" + 50.5" + 2" hinge +2" hinge + 2" latch = Total 107"
Exact same principle is used for gates of all sizes in 1-3/8" and 1-5/8" Frame models, in Galvanized and Color coated gates. Aluminum "L" corners: 4, Latch :1, Sets of hinges:2, Frame clamps: 6, Tension bars: 2, Sections of pipe: 4, (mid-rail on 5 & 6 ft high) chain link mesh: 1, Required Bolts & Nuts:1 set. You need to select the Post Hinge size to match the size of the gate ground post you will purchase to hang the gates on. Double Gate kits include 2 gate kits as described above and works similar to double door and latch in the center. 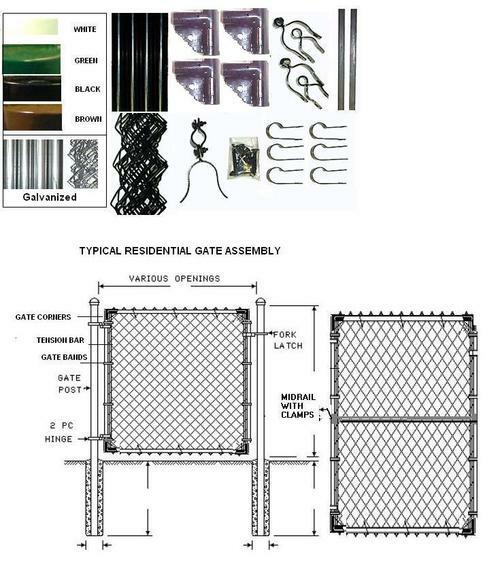 So an 8 ft wide double gate kit will have two 4ft gate kits, 20ft wide double gate will have two 10 ft gate kits…..and so on.You may substitute Galvanized Mesh in the Galvanized Gate kits only, with either Green or Black Mesh. To do so, put in the customer comment section of the order. Chain Link Fence Gate Kits are 1-3/8" Frame. Posts are not included and purchased separately. 5 ft, 6 ft, 7 ft, 8 ft and 10 ft heights have a horizontal mid-rail. Click picture - Kit Parts List : Aluminum "L" corners: 4, Latch :1, Sets of hinges:2, Frame clamps: 6, Tension bars: 2, Sections of pipe: 4, (mid-rail on 5 & 6 ft high) chain link mesh: 1, Required Bolts & Nuts:1 set. For Commercial gates, the corner clamps are pressed steel and are for 1-5/8" pipe. Other dimensions prorate the above calculations for 1-5/8" size.